There’s not really magic involved when it comes to love and destiny because we all make it happen. The movie Suddenly It’s Magic attests to that statement despite having a contradicting title. Of all three movies I’ve seen in the cinemas lately (see previous posts about Skyfall and Secret Affair), this is the one I’ve enjoyed the most although I didn’t expect much from it. In fact, a friend and I just don’t have anything to do last lazy weekend afternoon so we decided to kill the time with this movie. We both enjoyed it and giggled all the time as if we were still in high school. Before I write about the movie any further, below is the cast and characters. Mario Maurer will be a familiar face and name for those who are fans of romantic love stories from our neighboring Asian countries. In fact, he starred in that epic Thai film “Crazy Little Thing Called Love” which a lot of us have fallen in love with. Baifern Pimchanok looks familiar as she actually resembles 2NE1’s Sandara Park who had once become a household name in Philippine cinemas years ago. Going back to the movie, the story starts with Joey musing on the background about lovers becoming disillusioned about love. She was left by her fiancé before their wedding day. The same fate befell Marcus, who on the other hand had to deal with working with his ex on screen although she is no longer in love with him and is already involved with another. He loves his work but wanted a chance to get away from it all. Incidentally, their household maid gave him the idea to go on vacation. He chose Ilocos Norte in the Philippines and was all too happy that no one recognized him. The same cupcake was phenomenal for the couple. It was a choice between writing “follow your destiny” or “follow your heart” and Joey gave Marcus the latter. He went back for her but his mom found out his whereabouts and brought him back home but not without Joey. It was chaos with her being around hateful fans who adored the Marcus and Sritita love team. But other than that, it was the fact that he was not himself with her around. He wasn’t willing to give up his destiny but loves to be with her and follow his heart too. But they bid farewell to each other anyway to give way to destiny. But of course, you know what happens next. After Marcus got good breaks at work, he was able to take a break too and patched things up with Joey. Personally, it’s more than the “kilig” moment which got me hooked in this film. I love the symbolism evident in everything about the movie. To start with, I’ve mentioned about the choice between “follow your destiny” or “follow your heart” earlier. As for knowing what destiny is, this film simply described it as something we dream about since kids or if not, something we want to attain. When Joey let go of Marcus in pursuit his destiny, she finally understood why her mom had to set her dad free as well because he is supposedly destined to perform great deeds (politics related from a local office going up to the provincial as she grew older). The same fate actually befell Marcus’ mom and dad. His dad gave up the life he loves for the love of his life (his mom). Marcus’ mom asked him to leave the love of his life instead to get the life he loves because he just might have both in the end. She was also responsible for convincing Joey to leave, saying she’s going to be good for her son but not right now. Another symbolic chapter was about praying to God. The Buddhist Marcus asked the Christian Joey how her people pray. She said it’s like talking to God and saying what your heart feels even if He already knows about it. Joey, during her stay in Thailand also took part in Buddhist rituals and asked for blessings and prayers from the temple monks. The idea of writing down your wish and releasing it unto the universe through a balloon also rocks! Not that it’s any better than prayer but it works, at least in this film. Aside from symbolism, you will also appreciate the characters. Marcus, who knew nothing about the Filipino culture, was too eager to learn about it just to impress his Filipina love. The modern day harana with guitar riffs and rap song is something you will applaud. Marcus rapping the lines “I don’t want a sad cupcake no more…” and so on echoes through my mind till now. You will also be fascinated by the breathtaking sceneries both in Thailand and the Philippines, particularly up in the north at the Ilocos region. If you love traveling, you will even have an idea where to go and check in for both places just by watching the film. You’d even see names of resorts and inns. I don’t know if they were intentional though for promotional or advertisement purposes. If I’m going to rate this movie, I’d give it an 8/10. 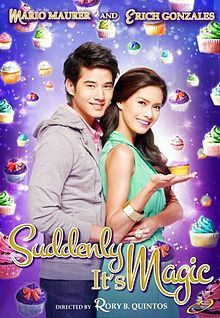 If you haven’t watched Suddenly It’s Magic yet, you should.